1. 720P HD camera lens resolution– please watch demo video in description. 2. 6pcs infrared LED light –clear video even in dark environment. 3. 30 Meter cable– Double longer than 15 meter models. 4. Sun visor — make screen clear to see under strong sunlight. 5. 4.3 inch screen — larger than 3.5 inch screen. 6. weather-proof carrying bag — easy to take camera to river / sea. you can get it as gift. 7. 100% positive feedback from hundreds of buyers so far — quality guarantee, 200+ buyers help you test it, No worry to buy ! Notice: this camera doesn’t support video recording function!!! if you need camera with video recording fucntion, please . 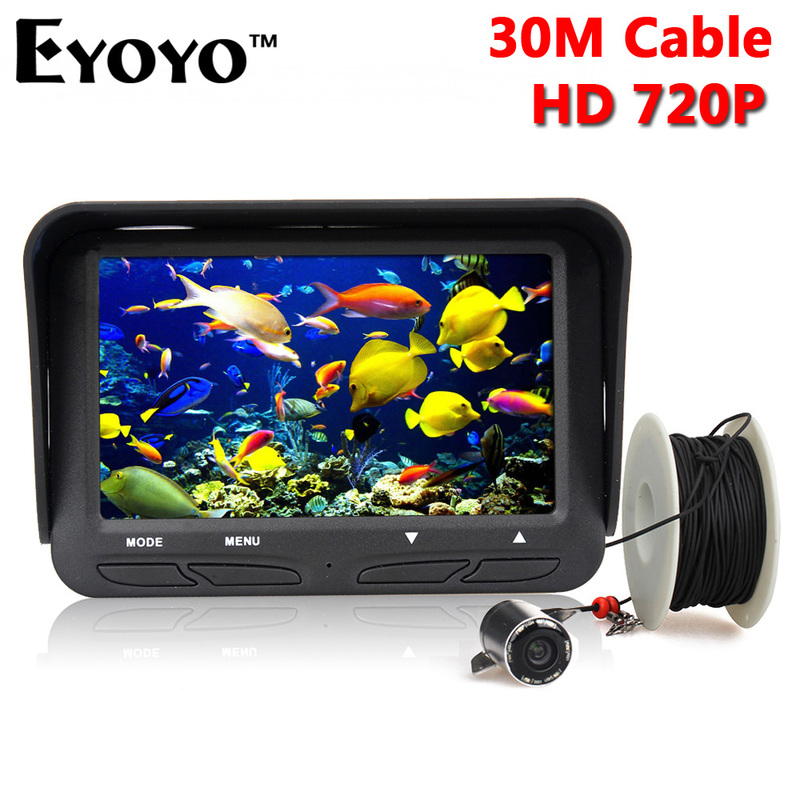 Brand Eyoyo, 4.3 inch LCD Monitor,HD 720P Camera, 6 Infrared LED. the Sunvisor will protect the monitor from strong sunshine. This fish finder set with HD 140 degree wide-angle camera design,letting you view the fish directly and clearly in both day and night. It will save you valuable hours of guess work and help you to find the best fishing areas.This portable fish finder is the best tool to bring the fish to you! 4.3 inch TFT LCD monitor. Underwater camera with 6 infrared LED let you view the fish clearly in both day and night. Waterproof and durable metal underwater camera housing. Cold-resistant, waterproof and pull-resistant camera cable (30M). Stake, bracket and fastener tape included, convenient for you to install the monitor in the way you like. Attention please!!! this model is Without DVR function and without SD card slot. if you need model B, please to buy. Thank you! Adjustable Bracket can fasten the monitor onto the metal stick. 2pcs Rechargeable Battery is included. Working time can be up to 6 hours.